This post originally ran on April 8, 2015. We figured it was worth resurfacing before this weekend’s release of Mission: Impossible — Rogue Nation. When the trailer for the new Mission: Impossible film landed last month, it seemed all anybody could talk about was the stunt of Tom Cruise hanging off an airplane. And with good reason — ever since the first Mission: Impossible movie, Tom Cruise films have featured more and more daring stunts, often performed by the actor himself. Impressive stuff, to be sure. But what do real stuntmen think of Tom Cruise’s stunts? To get a professional’s opinion, we turned to Randy Butcher, a veteran Canadian stuntman, stunt coordinator, and director who is currently the stunt coordinator for Orphan Black and has worked on a variety of films, including X-Men, Dawn of the Dead, K-19: The Widowmaker, and countless others. 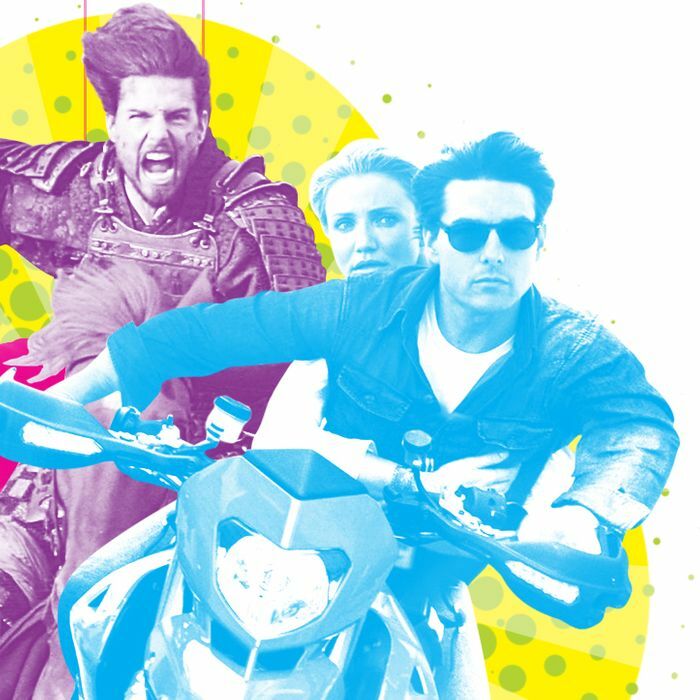 He took a look at some of Cruise’s best-known and most impressive stunts, and offered his take on how they might have been done — and whether that really is Tom Cruise doing those stunts. 1. Mission: Impossible (1996): Breaking into Langley, suspended on a wire. Butcher: This is the wire gag that everybody copied forever. I’ve personally copied it myself. That’s Tom, hands down. It’s a pretty contrived scene, but I was on the edge of my seat. He’s in a harness, and they’re using some Spectra Rope, which is better than cable. Whether it’s 30 or 40 feet, Tom is absolutely in that harness, using his own stomach muscles and his own balance to maintain that position and that shot. They don’t cut away from it at all. The fact that we can always see that it’s Tom really helps make the scene. There’s a profile shot of him over the computer, and you can actually sense his struggle to maintain that balance, which really adds to it. I know it’s not cool to like Tom Cruise anymore, but I’m a fan of his. I think he’s an underrated actor. His physical mannerisms complement what’s happening inside his mind. I like watching him act. 2. Mission: Impossible (1996): Fleeing as a giant fish tank explodes behind him. Butcher: I’ve done stuff similar to this. They have a build, they fill it with water, and the special-effects team goes through a great deal of trouble to place detonation devices on that glass. If memory serves, in the scene, Tom Cruise sticks some kind of explosive on the glass. And there’s a guy standing in front of it. And that guy is jerked backwards on a cable, which is taken out in post, of course. If you have the opportunity to watch this scene frame by frame, watch the top of the glass before the guy gets jerked through. As he rises into the air, they cut to the opposite side of the glass that he’s going to come through. And if you look closely, you will see that at the top of the glass is a little hole that breaks first — that’s where the cable is going through. They’ve probably cut a hole in the glass, fed the cable through it to his harness, then, on action, he’s jerked backwards, probably from an air ratchet. And as he blows through, special effects create that spider effect that completely shatters the tempered glass. And once he’s come blasting through, he’s opened up this huge, empty space in front of this tank for Tom Cruise to come through. And if you watch, you’ll see that Tom is at first behind a pillar. So he was out of harm’s way when they jerked the guy through. Once the glass is blown through, he comes out from behind that pillar and runs through the scene, towards [the] camera. I would have personally no issue at all putting an actor in that spot. I have no doubt that that’s Tom Cruise. (I’m pretty sure that that’s not live fish in there, though.) His only danger is that when this glass does blow, some of the broken glass will be carried along by the water, but not at any speed that would turn it into a projectile and potentially harm Tom. Plus, the lens has compressed the distance so much that he could be quite far away and you wouldn’t necessarily know it. On the TV series Orphan Black, I just put an actor through a window. I had a stunt double there, and the actor and I had a chat. He was into doing it, but the producers weren’t because it was the first shot of the day and we had to shoot in sequence because of the way this apartment was going to be destroyed. But I designed how to do it so this guy wouldn’t be harmed. I needed him to go through, but I didn’t need to drag him back — that’s where the danger would have been. And he did it. So we had his face coming through the glass, and not the back of the stunt guy’s head. And I can’t begin to tell you what a big difference that makes, to be able to see the actor’s face in a situation like that. 3. The Last Samurai (2003): The final charge. Butcher: I’m a big, big fan of this movie. I’ve seen it a million times. I’m a lifelong martial artist, so I really enjoy it. As I noted, I think Tom Cruise is a really accomplished horseman. He rides really, really well. And he’s obviously a quick study as far as physical technique is concerned — for example, fighting with swords. Sometimes, as in Far and Away, these stunts can be more impressive than the wirework stuff, because of all the other people around you. 4. Mission: Impossible 2 (2000): Opening credits free-climbing sequence. Butcher: I’ve done similar climbing shots here, on the Niagara Escarpment in Ontario. Cables and ropes were employed for actor safety and removed in post. So, just like hanging and climbing outside the tower in Dubai, Tom was suspended on cables and/or rope from overhead for his climbing scenes here. And that is absolutely him doing many of these shots. There is a stunt double used in some of these free-climbing scenes — as a matter of fact, somewhere in my notes, I have the name of the fellow who did it. But the shots comprising the sequence are seamless. With the advances in CGI technology, it’s getting difficult for even old pros like me to tell the difference. Shooting climbing elements on rock setpieces against a green-screen in a studio would have been something to consider had John Woo been working with another actor, I suppose. To do that, you would create in a studio a point of rock maybe 10 to 15 feet high, and put a green-screen behind that. And then you would have the actor climb that, and hang from that. But Tom Cruise has balls of steel, and a stuntman’s nerve. There’s absolutely no reason for me to believe he did not do these climbing shots in question. I respect him very much. He surrounds himself with skilled professionals, and the trust goes two ways. 5. Minority Report (2002): Jumping on his pursuer’s hoverpack and flying around. Butcher: Every one of those guys in those hoverpacks were on cranes — either on giant cranes, or on mechanisms built on the rooftops of those buildings. I imagine they were all in harnesses and cabled in above their heads. This movie is from 2002, I think; the technology of flying back then wasn’t up to what it is today, and you can tell the stunt guys are on cables and bobbing side to side. When he jumps on that other guy, Tom would have been in a harness on cables, and the two of them would have matched, and then they’d be lifted by some sort of mechanism. I don’t remember whether it was Cruise doing that stunt or not. But I don’t see a reason why it couldn’t be him. When we do wirework of that nature, everything is measured out perfectly — timing, speed, distance, everything. It’s all in the edits. Your editor’s your stuntman’s best friend. You see Cruise come down from a low shot, and then you see him get on the guy’s back from another shot. And absolutely, it’s Tom Cruise doing a lot of that stuff. The wirework takes some nerve to do, but [it’s] relatively very safe to do. Things to do go wrong — if anything ever jammed, they’d have to get him down from there. There has to be a safety team ready to come off the rooftop to transfer whoever’s in trouble to the rescuer and lower [him] to the ground. 6. Mission: Impossible 3 (2006): Jumping off a skyscraper in Shanghai. Butcher: When Tom starts his run, and then jumps off, with that city in the background, that is one of the most beautiful plate shots I’ve ever seen — somebody shot that from the roof of the building in the movie. But Tom jumps off a build in a studio, with a green-screen. He falls about 25 feet or so, and then it cuts to the side view. Tom Cruise may have fallen towards an air bag, and then that shot was married to the plate shots of the city. Then we cut to a wide profile shot: This is not Tom Cruise. But at the same time, this stunt is not being done from those buildings. It’s my understanding that they couldn’t do it. They went out and got plate shots. Then they actually built models of this city, projected the plate shots on 3-D models. Watch the stunt guy closely in this side shot, after the shot of Cruise jumping off the building — you see him start to fall to the ground, and ever so slightly, he moves forward, which is gravitationally impossible. So, I would guess that he’s on what we call a highline. (Watch, some stunt coordinator is gonna call me and say that’s not how they did it now.) But I can build a highline from one place to another and leave it slack, so that when he takes off of one point, he begins to fall — but as the highline becomes taut, he is now going to go in the direction of the highline, which is on the next building on the other side of this street. Then, when he falls on the building, they may have had Tom Cruise falling against a green-screen, on a cable, for maybe 30 or 40 feet, to get those shots with the camera running beside him — but that was not done here at this location. Good stuff, though. 7. Mission: Impossible 3 (2006): Cruise hangs out of a car, close to the ground, firing away during a high-speed chase. Butcher: The excitement of the action, the illusion, is all in the cuts. But Tom Cruise, in a harness, hanging outside that car — absolutely. You’ll notice that his left arm never leaves where it is. I’m quite certain that he’s probably triangulated into the car. I would have him in a harness, I would harness him low, and I would harness up his arm high. If he wanted to drop his gun hand and whack the ground with it, he could. But otherwise, he couldn’t touch the pavement. He couldn’t hit his head. He is locked in there so tight. There is either a MotoCam [a camera mounted on a motorcycle] or a camera car, with a Russian arm, with a crane on top, following him. But that’s definitely Tom Cruise doing it. He’s got a great deal of physical skills, he knows his team and trusts his equipment. That’s extremely important. He knows what a harness can do, he knows what a Spectra Rope or cable can do. There are a lot of actors who would never do anything like this. I’m really surprised his producers let him do it. Of course, he often is one of the producers, so maybe that’s it — there’s nothing the insurance company can say about it. But man, if he ever got really hurt, you’d have a couple-hundred-million-dollar movie going down. The other producers must not go to set and watch this stuff — they’d have a heart attack. I’m really impressed with his willingness and ability to do a lot of this stuff. 8. Knight and Day (2010): Cruise falls on the hood of a car, and hangs onto it during a chase. Butcher: This scene is hilarious. So bogus, but so fun. Just looking at the angles and the movements of the camera, I don’t think he’s on that car rooftop. It’s likely the guy surfing the car in the wide shots is a stuntman; in close-ups, you cut to Tom. It could very well be Tom is riding on that car in a street, but I would never put my actor on top of that. No, you do it in a studio, with rear-screen projection. Then you marry that with the CGI of the car blowing up in front of me and flying over me. You see the motorcycle helmet fall on the car hood, and Tom Cruise lands on the camera looking through the hood. That is probably a plate shot they did prior, and this is now rear-screen projection as Tom falls on the hood. And then he talks, and then they cut back to Cameron Diaz, most likely with the rear-screen projection behind them. And then you see there’s an SUV about to overtake the car — that is a stuntman laying on the hood of that car firing back at the SUV. When they cut to a close-up of Cruise on the top of the car, going through the tunnel, that’s probably Tom in the studio again. When the car rolls over him — that’s obviously not done in-camera. That’s all CGI. 9. Knight and Day (2010): Cruise and Cameron Diaz ride a motorcycle during a chase, as she switches position around him to shoot at their pursuers. Butcher: Tom Cruise is an accomplished rider, so I’m sure he rode the bike for some of these shots. But mostly, I’m pretty sure there were two stunt doubles. When Cameron Diaz is on the back, her stunt double is behind Tom Cruise’s stunt double in the wide shot of the motorcycle, racing through town. That’s a given. That switch, where Cameron Diaz’s character slips around in front of Tom, that’s a stunt double doing that. And then they would cut to Tom and Cameron on a process trailer or stationary, in-studio, with rear projection behind them, with fans in their faces. Because they’re cutting from wides to close-ups. They’re very well-done, because it’s all in the illusion created by the editor and the stunt coordinator. People often focus on the wirework and how dangerous that looks, but actually, a stunt where you’re racing a sport bike with a passenger — especially in front of you, like they did with that switch — is actually a lot more dangerous. You’ve got an expert motorcycle rider on the bike, to be sure, and the woman switching is an expert as well. But the fact that they’re taking corners and there’s cars in their way — that makes it a lot more dangerous. More things can go wrong with that gag than with, say, wirework outside a tower in Dubai. The wirework takes nerve, but it’s very safe. 10. Mission: Impossible — Ghost Protocol (2012): Climbing (and hanging from) the Burj Khalifa. Butcher: Like I said, balls of steel. He was definitely outside that building. He hung outside that building. I’m not convinced it’s him running down the side. It’s entirely possible that it is. But the close-ups of climbing, with that glove — that takes incredible nerve. If you’ve ever been up to the top of the CN tower in Toronto — which is no longer the tallest building in the world — they have a skywalk where you can go outside on the roof of the building, and they put you in this big orange jumpsuit and they cable you off, and you stand on the edge of the building and lean out over the city backwards. It’s an incredible experience. And you’ll get some sense of the “Oh my God” that must have gone through Tom Cruise’s heart when he hung on that rope outside the tallest building in the world in Dubai. Some of that stuff is done in the editing — when he’s kicking through the window, for example, that’s a setpiece. But when you think about it, what he’s doing outside the Burj Khalifa on cable or Spectra Rope, is exactly what they did on the first Mission: Impossible movie, where he comes down to the computer. Just trusting your harness, trusting the guys that are controlling — if he can do it from 40 feet, he can do it 3,000 feet up in the air. It’s no different, except for wind and chill. A lot of these Mission: Impossible stunts are wirework — guys being pulled. It’s time-consuming, and that costs money. In order to do it properly, you need the money, and that’s why these movies look as wonderful as they do. I used to work with Wade Eastwood, the stunt coordinator on his new Mission Impossible movie. Tom Cruise obviously has a really good team around him, the trust that he has in these people is incredible. And vice versa — they trust him. He’s a good student, he does it properly, and everybody gets to go home at the end of the day.